» It Pays to Have a Company That Does It All and Stands Behind Their Work T’boot! Growing up, Jim and Mike’s parents taught them to set challenging goals and standards; they were raised to always have high expectations for themselves and their encounters in life. Equipped with the tools necessary to deliver on their promises, the TermiGuard and Fenwick founders are committed to their business and to their customers and employees. At TermiGuard Services, we practice discipline, determination, perseverance, and a ‘never-quit’ work ethic. We live by these qualities, and by doing so, we’ve fostered that same culture into our company as a whole. This business was built to be effectively different from the rest – embracing and living the principles and values Jim and Mike grew up with – treating people the way we’d want to be treated. We offer you a family of home services including real estate repairs, pest and termite inspections and routine control, crawlspace encapsulations, mold remediation, basement waterproofing, structural and foundation repairs, and property restoration and remodeling – such as roofing, siding, windows, kitchens, bathrooms, finished basements and more. It is our goal to serve as a “one-stop-shop” for homeowners; we take that relationship with our customers seriously. TermiGuard’s Pest Services division, for example, provides a few different service programs which include termite coverage. 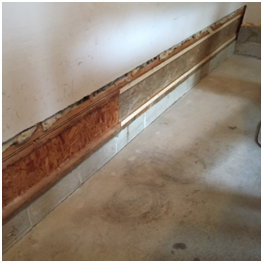 Termite Treatment Warranty Renewal (TTWR) programs. Depending on what your pest control goals are, each program has its advantages. If you were not aware of, or have questions about, any of these programs, contact us in the office! We would be more than happy to go over each and help you figure out what best fits your needs. But what happens if or when things go a little wrong? The warranty which we include with any of those programs is what sets us apart from some other choices you may have had in the past. Normally, I wouldn’t put a price on homeowner peace-of-mind, but in this case I’m going to value it at $75,000 … that’s because our termite protection covers exactly that! If your home ever needs treatment for a new infestation of live subterranean termites – as long as you are covered under a current warranty or program – you don’t have to worry about that additional cost. TermiGuard Services will cover the treatment up to $75,000! But wait… what if that live infestation caused new damage? Because we have an entire division devoted to reconstruction, remodeling and remediation that our customers take advantage of – that workmanship is also extended to our pest control warranty customers, when things don’t go quite as we planned! Any damages, from a live active infestation, which occur due to those unwanted, pesky wood destroying termites would be addressed by our TG Fenwick division at no cost to you … again up to $75,000! It pays to have a company that can do it all! 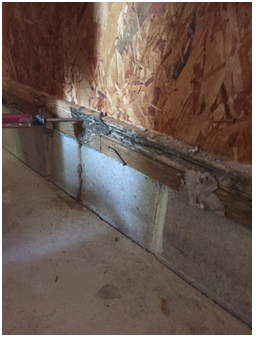 Take a look at a recent termite warranty customer who encountered a new infestation… and unfortunately new damage as well. 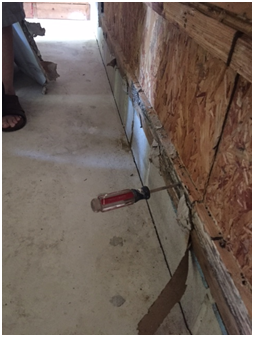 After confirming the insect to blame was in fact termites, we performed a spot treatment of the affected area. After the product application, we sent in one of our TG Fenwick crews to make this Blackwood, NJ home’s garage ready for use once more. When things go wrong, you’ll be glad you’re doing business with a company which acts quickly and efficiently to fix the problem! Sometimes, the way a service company handles themselves when things go wrong can tell you more about their character then when the plan goes off without a hitch. As consumers ourselves, we’ve felt the pain caused by uncaring contractor attitudes and their apparent disregard for old-fashioned customer-centered service. Although we always strive to be, we’re not perfect. But, it’s what we do when things don’t always go exactly as predicted, how we handle and correct things – to make them right – that separates TermiGuard Services & Fenwick from the many shoddy service providers folks tolerate today. Kelly has been with TermiGuard Services since 2012. She shares the company's passion for helping homeowners achieve all of their goals when it comes to pest control, home renovations, and mold/water remediation services. She spends a lot of time contributing to TermiGuard's pest control division; if you call to find out more about one of our programs, you'll most likely speak directly with her!